Charcoal football jersey style tshirt, with original artwork design by OOak - Just For You! to showcase your boy or girl wrestler. Available with or without glitter. Choose short sleeve (unisex) charcoal color $25 (as shown), long sleeve black (mens size) add $5 or hooded sweatshirt black (mens size) add $15. 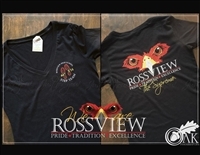 Rossview Hawks Glitter V-Neck Tshirt for ladies. Contact OOak to personalize shirt to meet your organizational needs or individual needs.